Fine wines have unique chemical "fingerprints" that could authenticate their origin and quality, scientists have found. Malbecs from Argentina and California made by the same winemaker and using the same protocol had distinct molecular signatures and flavours. But the delicate aroma of a rare vintage can quickly be eroded by poor storage after bottling, the team said. Details were reported at the American Chemical Society meeting. Despite the cynicism over wine critique - and the rather grandiose adjectives lavished upon certain appellations - it really does matter where your plonk comes from, according to the researchers from the University of California Davis. They are attempting to fingerprint "terroir" - the unique characteristics that the geography, geology and climate of a certain place bestows upon a wine. Subjective regional character is based on the appearance, aroma, taste and mouthfeel (texture) of the wine - all of which combine to create its flavour. But demand is growing for a more objective test - to help consumers bypass woolly terminology, protect artisan producers' intellectual property, and help auction houses detect fraud - a growing problem. Earlier this month, wine fraudster Rudy Kurniawan was sentenced to 10 years in jail for selling over $20m (£11.9m) worth of fake vintages which he mixed in his kitchen - fooling expert collectors. Suggestions for a foolproof forensic test of provenance have involved particle accelerators and carbon dating via atomic bomb residues. In search of a more straightforward signature, the UC Davis team decided to focus on volatile compounds - those which would be smelled when drinking wine. They took wines from the same Malbec grape variety in different regions of Argentina and California - and asked trained experts to evaluate them for 20 sensory characteristics. These included aroma (floral, chocolate, dark fruit) taste (sweet, bitter) and texture (viscosity). The Argentinean Malbecs tended to have more ripe fruit characteristics, sweetness and higher alcohol levels, while those from California were more bitter, and had more artificial fruit and citrus aromas. These differences were not only subjective - they were mirrored in distinct chemical profiles detected by gas chromatography-mass spectrometry, according to the results presented at the conference. 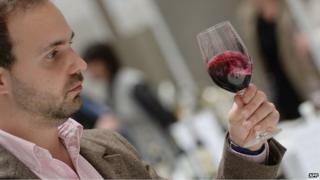 "Are there regional and subregional profiles of wine? From a chemical point of view - yes - there are extremely clear differences," said lead author Dr Hildegarde Heymann of UC Davis. "We speculate this terroir is caused by altitude - the Argentine wine vineyards were much higher up than the American ones. Soil moisture, soil type and day/night temperature would also be factors." When it came to sensory perception, the regional difference was not as clear. "That's because when we taste or smell wine we are combining something - chemicals can mask each other. The brain is interpreting more globally," Dr Heymann told BBC News. In other words - this chemical fingerprint can't tell you if a wine will taste "good or bad", but it does a great job of authenticating its region of origin. But what of specific vintages - from particular wineries? Can they be authenticated? A separate, "elemental fingerprinting" study, measuring the metal profiles in soils and grapes, found that even within a single vineyard there can be enormous variation. Elements like boron, zinc and nickel provide a "barcode of the earth" which is matched in the grapes, according to research by Dr Susan Ebeler, also of UC Davis. And no matter how exclusive the terroir or vintage, the delicate balance of flavours in a bottle can quickly be ruined if poorly stored in a home cupboard or cellar, according to Italian scientists. They compared bottles of Sangiovese wine stored for 24 months in a professional wine cellar (15-17C) with a dark room at household temperatures (20-27C). "We discovered that a relatively small rise in temperature speeds up several chemical reactions associated with wine ageing and even promotes new reactions that are not observed at lower temperatures," said lead author Dr Fulvio Mattivi, of the Fondazione Edmund Mach Research and Innovation Centre, San Michele all'Adige. "After six months under domestic conditions, the wine in the bottle was approximately as 'old' as a bottle from the same producer and lot stored for two years under cellar conditions. "Perhaps it's time we rewrite the labels on wine bottles. Forget the vintage - it's not simply the number of years - it's the chemical age that really tells you how good a wine will taste." Wine fraud: How easy is it to fake a 50-year-old bottle?